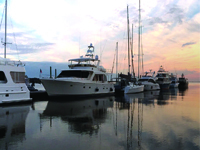 Morningstar Marinas – Golden Isles is a full service marina specifically geared to help you enjoy your time on the water. Local marinas in and around St. Simons offer everything boaters need for a relaxing day on the water or a comfortable overnight stay. The security, convenience, competitive dockage fees and prices for rack storage make local marinas a cost effective and stress free option. Contact one of the area’s marinas for more information.